How sunny is your garden? Helpful tip to use today! Knowing how much sunlight your garden patch gets is critical to growing a successful garden. It’s how you know what kinds of flowers to plant. Most flowers come with white stick labels in the soil with information on the type of sun they need – full sun, partial sun, shade. Today is a great day to see exactly where the sun shines on your garden. Go to your garden space and notice where the snow has melted on your patch. Where the snow is gone, the sun is stronger. 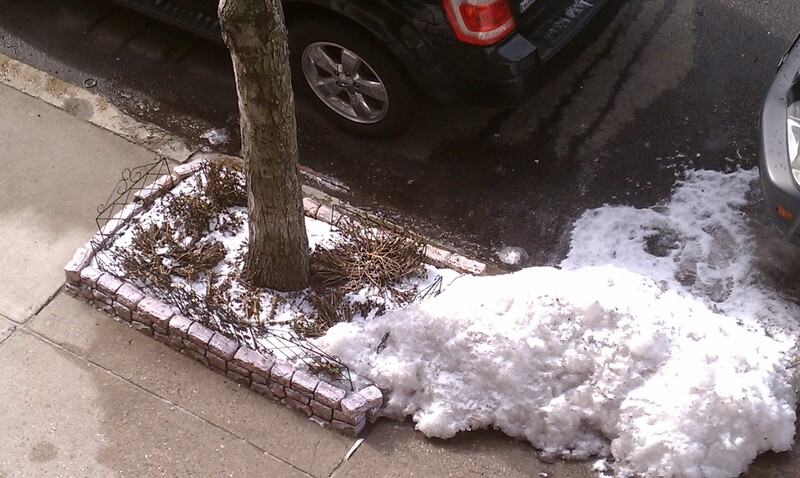 If snow remains, that’s obviously a more shady space. This information will come in handy when you are choosing your plants this Spring. Yes, that’s my tree pit garden in the picture above. It looks so sad now but the good news is that it gets good sun on the left and gets decent overall sun all day long. Big thanks go out to Tom Smarr from the Rose Kennedy Greenway for sharing this tip! Beautiful website. Enjoyed your writing style and pictures! Great Job!